We originally planned to activate Mount Arden, VK5/NE-034, on Sunday 14th June. This was not possible because of the rain and the track was closed. The land-owners, who were advised of our radio interests, invited us back to their property, the Argadells, on our return from Farina. They are of course well aware of radio matters. Mount Arden is the site of a number of commercial installations, a CB repeater and VK5RAE, the 2 metre repeater. Thus, 22nd June became Mount Arden day! Our Nissan was the lead vehicle on the trip to the summit. The sun was shining and we were looking forward to the challenge. David and Joy chose to travel with us to the summit. This was a genuine 4×4 track, steep, slippery and with loose rocks. They had previously experienced my driving on the approximately 100k 4×4 trip to Lake Torrens National Park. They survived that experience and were prepared to trust their lives to me again. I think if they had studied the track in advance they might have changed their minds! However, they are still speaking with me! There are a number of You-tube videos of drivers on this track. Mount Arden is a great platform for some excellent views south. The power station at Port Augusta was visible as was the gulf. On the summit it was very windy and cold. However, Paul, David and I all successfully activated Mount Arden. My log is reproduced below. 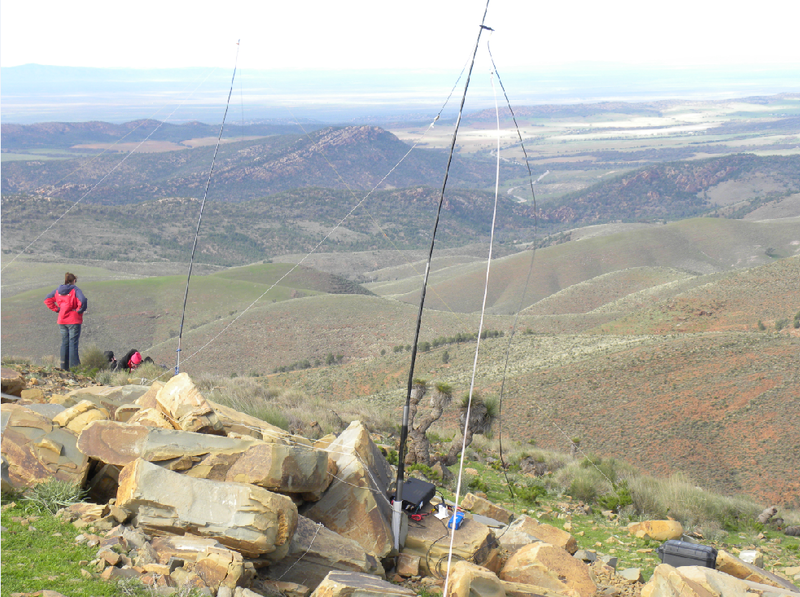 After qualifying the summit on 40 metres using Paul’s radio I went back to my radio and had three contacts on 30 metres. I also tried six without success. I could hear the six metre beacon on 50.315 MHz in the Barossa Valley. Then came the drive down led by Paul.